WASHINGTON: President Donald Trump said late Wednesday that he would deliver his State of the Union address once the federal government reopens, capping a day of brinkmanship with Speaker Nancy Pelosi, who told the president that he was not welcome to deliver the speech in the House chamber while the government is partly closed. "As the Shutdown was going on, Nancy Pelosi asked me to give the State of the Union Address," Trump wrote on Twitter shortly after 11 pm, hours after he had said he would look for another venue for the speech. "I agreed. She then changed her mind because of the Shutdown, suggesting a later date. This is her prerogative - I will do the Address when the Shutdown is over." The president's seeming capitulation came even as House Democratic leaders said they were prepared to give him a substantial sum of money for border security - perhaps even the $5.7 billion he has requested - but not for a wall and not until he agreed to reopen the government. That figure is roughly double what Democrats had previously approved. On the other end of the Capitol, in the Republican-controlled Senate, lawmakers prepared for crucial votes Thursday on two competing proposals - one backed by Trump and Senate Republicans, the other by Democrats - that would bring an end to the partial shutdown, though neither might garner the 60 votes necessary for passage. On Day 33 of the longest government shutdown in history, Washington took on the air of a split-screen television. On one side was a spat between Trump and Pelosi - a powerful man and an equally powerful woman - over the president's constitutional duty to periodically report to Congress on the state of the union. On the other, the House and Senate trudged along with their daily business, with lawmakers in both parties grasping for a way out of the shutdown stalemate. Those bills take very different approaches. Trump's bill would include $5.7 billion for the wall and extend protections to some immigrants in the country illegally - protections that he himself revoked - while sharply curtailing access to asylum. 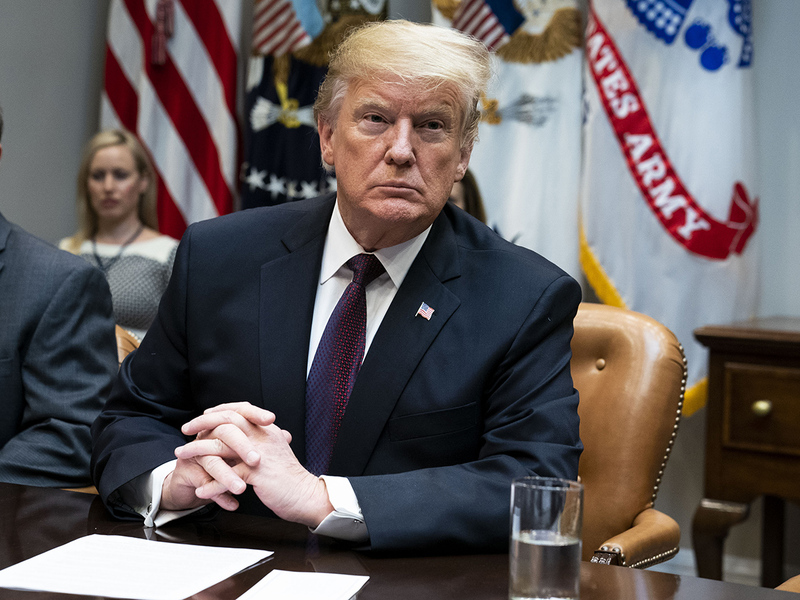 The Democrats' measure, which has been already passed by the House, would simply fund shuttered government agencies through Feb. 8, with no wall money. Responding to Trump just before midnight, Pelosi urged the president - who pledged to deliver his address in the "near future" - to accept the Democrats' bill. "Mr President, I hope by saying 'near future' you mean you will support the House-passed package to #EndTheShutdown that the Senate will vote on tomorrow," Pelosi wrote on Twitter. "Please accept this proposal so we can re-open government, repay our federal workers and then negotiate our differences." For Trump, it would have been a moment to command the stage - with television cameras rolling and Pelosi stuck behind him, trying to figure out whether to grimace or nod. Now, the president is trying to paint Pelosi as a left-wing radical who canceled the address for political reasons, despite her assertion that she simply wanted to postpone, not cancel, it because of the burden it would impose on Secret Service agents working without pay. "It's really a shame what's happening with the Democrats," Trump told reporters at the White House. "They've become radicalized." In the afternoon, Trump pledged to "do something in the alternative," and it was not clear at the time whether he had completely given up on holding the speech in the Capitol. Some lawmakers raised the possibility that he could deliver it in the Senate chamber. But others, as well as some Trump advisers, suggested it would be better for him to issue the speech at the border or during a rally. But ultimately, the president wrote on Twitter, he decided against an alternative site "because there is no venue that can compete with the history, tradition and importance of the House Chamber." He added, "I look forward to giving a 'great' State of the Union Address in the near future!" While the president is permitted on the floor of the House, he needs an invitation to speak. Pelosi had invited Trump to deliver the speech in a letter Jan. 3, when she was sworn in as speaker. But in a second letter Jan. 16, she warned that there were security concerns, and asked that they "work together to determine another suitable date after government has reopened," or that Trump consider delivering it in writing. On Wednesday, Trump called Pelosi's bluff, with a letter saying that he had checked, and that the Secret Service had no such concerns. So he said he was accepting her initial invitation. Republican lawmakers piled on. The House Republican leader, Kevin McCarthy of California, released a video on Twitter of him signing the resolution formally inviting the president to the House. "Retweet if you agree that the State of the Union should proceed as planned," McCarthy wrote. She also told rank-and-file lawmakers that they should not get "too bogged down" on what legislation was being voted upon - a direct message to some of her restive centrist freshmen, who have been meeting with Republican freshmen to discuss a bipartisan path out of the shutdown. The appeal seems to have worked; as they emerged from the closed-door meeting, rank-and-file Democrats appeared united behind their leaders' demand that the government open before border security negotiations took place. "There's an overwhelming consensus that this is about establishing that shutdowns are wrong," said one centrist, Rep. Tom Malinowski, D-N.J. "From my standpoint, and I think this is the consensus of the caucus, everything is negotiable. Border security is negotiable. Immigration policy is negotiable. Shutting down the government is not negotiable, and we're angry about it." Malinowski went on: "If we give in to this tactic in any way we will validate it, and there will be no end to these shutdowns, and the people who suffer today will be suffering again and again and again. We cannot have that." House Democrats are also drafting their own plan for border security, which is expected to be made public in the coming days. "We are going to be talking about substantial sums of money to secure our border," Rep. Steny Hoyer of Maryland, the majority leader, told reporters. Rep. James E. Clyburn of South Carolina, the No 3. Democrat, said separately that Democrats could back a $5.7 billion funding measure that included drones and refitted ports of entry - but no wall. That is the amount Trump has demanded for the wall he wants to build on the southwestern border. "Using the figure the president put on the table, if his $5.7 billion is about border security, then we see ourselves fulfilling that request, only doing it with what I like to call using a smart wall," he said. Both Hoyer and Rep. Hakeem Jeffries of New York, chairman of the House Democratic Caucus, seemed to leave the door open for eventual negotiations to include talk of some kind of border barrier - so long as the government was open first.